We are all animals, and I mean that more as a compliment to animals than an insult to humans. But we seem to have forgotten it. For the vast majority of our 200,000-year “human” history, we lived on the land with our fellow creatures. Smartphones, electricity, toilets, toilet paper and canned peaches were all just invented in the last historical eye-blink; that leather car seat, the car itself, even the wheel—all were invented in just the most recent microscopic piece of human history (the microscope itself being invented essentially last week). Out of all the animals, our daily synthetic world must be the least influenced or even reflective of our long history and the exploding evolutionary cauldron that turned us into humans. Most of our faces will never be lashed with rain as we huddle under a tree, nor will we rip the leg off a wildebeest with bloody glee because we’re no longer in any immediate danger of starving. Our ancestors did all of that and then some. Inside every single one of us are the thousands of ancestors who lived and died as hunters, gatherers and social-alliance builders that would make our modern concerns look like mental baby food. I started really thinking about this chasm between how we evolved and how we now live when I recently spoke at a conference on environmental education. Two educators presented on an amazing kindergarten program they were running where the kids spend more than 75 per cent of the school day outside. There were gasps in the audience; the idea of spending 75 per cent of school time outside was, even in that pro-outdoor crowd, a pretty wild idea. But it wasn’t long ago that the average child on the plains of Africa would have spent zero time in anything resembling a modern building, much less the 90 per cent of the day inside, or more, that’s normal for most kids today. 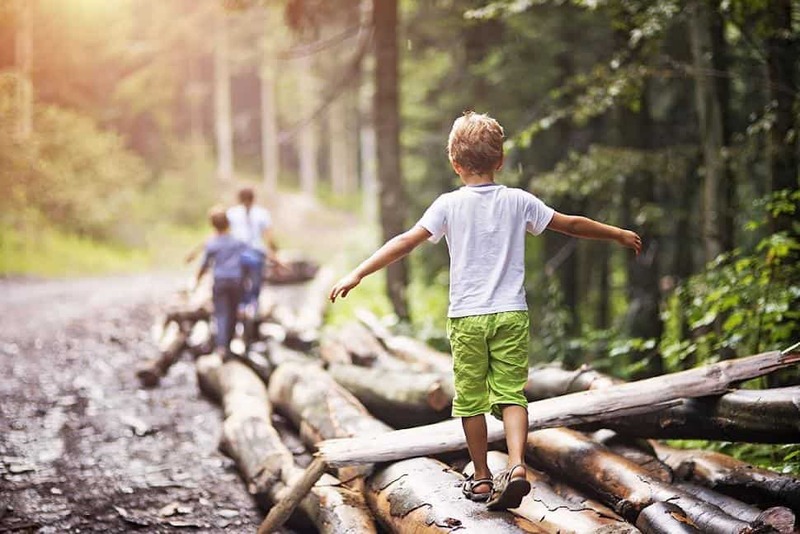 The average kid apparently now spends a grand total of 4.5 hours per week playing outside. That’s roughly the same amount of time the average kid spends per day watching various screens. Adults? I couldn’t even find any solid data on the subject, but few adults are spending even 4.5 hours per month outside. But the number-one question directed at the presenters was: “So, do the kids go to the bathroom outside too—and how does that work?” This led to a humorous discussion on how to deal with kids going to the bathroom outside. My own kids are in a “forest play” program, where the parents often have a similar question about the facilities. Both my daughters solved this seemingly delicate question as our ancestors had for hundreds of thousands of generations before them. Remember, toilet paper is a recent invention, but leaves have been around for a while. But I doubt most of my fellow humans could do even the most basic animalistic requirement of a full squat to get the job done in the woods. This basic sign of physical function is either so alien as to require an explanation of how to do it without an entire room and a toilet, or physically impossible. I’m not an expert on sanity, but every other animal goes crazy when it loses its natural way of being. There’s a mounting body of evidence that for much of our history we lived in relatively small bands of fellow humans, and actually worked far less to survive than we do today. Most of our time was spent outside, with other people, in work that mattered to our very survival. And even that work was often relatively casual; the average work week across the industrialized world has increased radically, but even the slackest among us are workaholics compared to the !Kung bushmen, Hadza men or other so-called “primitive” tribes who work less than four hours a day—leaving plenty of time to socialize, or whatever they feel like. The average lion on the Savanna socializes and sleeps for up to 20 hours a day (female lions sleep less and work harder, another human/animal parallel). So, we’re living the equivalent of too many rats in too small a cave, with our historical social groups reduced to Facebook and Tinder. As I drove home after my own presentation on risk and reward, I thought back to the times in my life where I’ve been happiest, and when my own kids and fellow humans have seemed happiest. All involved a tight social group, large amounts of physical exercise outside, minimal screen time and intensely meaningful physical and mental activity. But to truly understand what’s necessary for a solid life I have only to look at my dog as we prepare for a walk. Perhaps the average dog knows what makes it happy a lot better than we do. I don’t know how to implement the clearly needed, massive societal change toward more time being an animal outside, but when school shootings barely make the news cycle and road-rage deaths surprise no one then something is clearly amiss. My goal for the remainder of 2018 is to stop being so damn human and return to my roots as a decent animal. I’ll have to work on my own deep squat.